A while back I was struck by the similarity of these two characters' poses. Both seem to mean business. Both are properly armed for the task at hand. And both are confronting archators in the proper way to confront them- most of the time. Both could be considered heroic. Both characters have their fans; there's probably even a lot of overlap. But I still like one of these a lot more than the other. If I had to choose, I'd prefer to be friends with Malcolm Reynolds. Dirty Harry chose to be a tax junkie, and an enforcer of "laws". Not a good guy in my eyes, even if the thugs he went up against were worse. 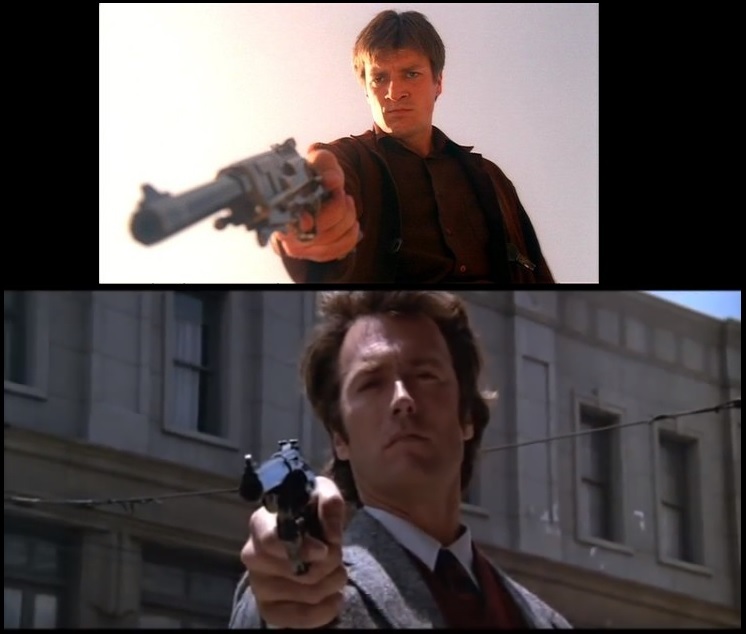 I might even like the actor Clint Eastwood more than actor Nathan Fillion, but as for the characters portrayed above, it's no contest.